Hollywood & Highland - Located right in the heart of Hollywood, the bustling shopping complex has been credited for breathing new life into its surrounding areas. Built to the cost of approximately 615 million dollars, it opened its doors in 2001. The complex's courtyard was inspired by the D.W. Griffith film Intolerance, and its center boasts stunning views of the legendary Hollywood sign and the Hollywood Hills. Occupying nearly two whole blocks, Hollywood & Highland is comprised of 75 shops and restaurants, a movie theater, a nightclub, 65,000 square feet of gathering spaces, the Renaissance Hollywood Hotel, TV broadcast studios and last but not least, the Dolby Theatre. Melrose Avenue is a hodgepodge of all that encompasses L.A. This diverse district manages to be eccentric and mainstream, affordable and upscale, and grungy and glamorous all at once. The one constant about this vibrant, lively block is that its shopping, dining and people-watching are second to none. At the edge of the Melrose Avenue shopping district you'll find Pink's Hot Dogs, the famous hot dog stand on the corner of Melrose and La Brea Avenues. 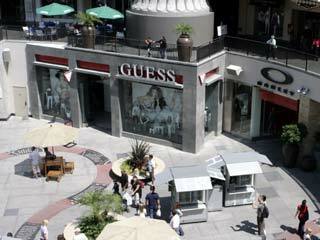 Sunset Plaza Mall - a collection of upscale stores and restaurants on the Sunset Strip. There is a parking lot in the back, off of Sunset Plaza Drive. Street parking is difficult to find and is subject to restrictions. 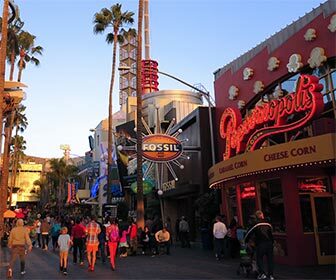 Universal CityWalk - Popular with both visitors and locals, Universal CityWalk is a busy area located between the parking areas and the theme park, where guests can enjoy a variety of restaurants and shopping opportunities and even take in a movie or two. You'll find a number of popular eating establishments here, such as The Hard Rock Cafe, Bubba Gump Shrimp Company, Buca de Beppo, Tony Roma's Ribs, and the Wolfgang Puck Cafe. You'll even find brand-name stores like Skechers, Quiksilver, Hot Topic, Guess, Fossil, Billabong, and Abercrombie and Fitch. Universal CityWalk can be easily reached from Hollywood and Highland by using the Metro Red Line train. Robertson Boulevard Shopping District - Robertson boasts a crop of chichi boutiques and upscale eateries that attract starlets and the paparazzi who feed off them. Thanks to the likes of US Weekly and TMZ.com, this shopping district has become a destination on many tourists' lists. West Hollywood Gateway resides at the corner of Santa Monica Boulevard and La Brea Avenue, between Hollywood Boulevard and Pink's Hot Dogs, which is near the Melrose Avenue shopping district (see above). West Hollywood Gateway is anchored by Target department store, and Best Buy electronics store. There are some places to eat and get refreshments such as Baja Fresh (Tex-Mex), Daphne's (Greek) and Jamba Juice, among others. The historic Formosa Cafe is adjacent to West Hollywood Gateway, and is open daily for lunch and dinner, as well as on Sundays for brunch .